Call 732-598-7700 to see the Freehold condos for sale 07728 or condos in Freehold. The condos in Freehold are in nine condo or townhouse complexes. Those complexes are Adelphia Greens, Briarwood, Deerbrook, Independence Square, Poets Corner, Raintree, Stonehurst, Strickland Farms and Wyndham Place. All in all, there are about 3,400 Freehold condos. To find one bedroom condos, look in Raintree and Stonehurst. Two bedroom units are available in all of the complexes. Condos with three bedrooms can be found at Independence Square, and also in Poets Corner, Strickland Farms and Wyndham Place. And homes with garages can be found at Poets Corner and Raintree. Wyndham Place is the only complex currently approved for FHA financing, as a result, you can purchase those homes with a low down payment. This approval expires in June, 2019. To tell the truth , you two were one of the nicest couples we've ever dealt with! It didn't matter what came up , you took it all in stride. Thank you for making the purchase of our new home so easy! Not only are Bunny and Art knowledgeable.... they are a very nice and personable couple. They did a very competent job and we also had some nice friendly conversations. We were definitely put at ease by having these two walking the road with us. We can't thank them enough. We've been busy getting settled and our home is coming along nicely! We highly recommend Bunny and Art. New Jersey Transit provides bus service along Route 9 for both local and to New York. Freehold does provide Park’N Ride lots along Route 9. In addition, some complexes are within walking distance to Route 9. A lot of entertainment is available in Freehold Township. For example, free summer concerts are held at Raceway Mall during the summer. In addition, Downtown Freehold also has summer concerts. And live theater is available in Red Bank. The PNC Art Center in Holmdel also has a summer concert series of big name bands. Six Flags Great Adventure is one town away. Freehold Township also has numerous parks. All types of shopping is available along Route 9. In addition, there are also many restaurants. Most of the popular chains can be found either in Freehold or the neighboring towns. But we cannot seem to find a good seafood restaurant. Would someone please open one? Furthermore, Freehold Raceway Mall has over 200 stores. Kindergarten through 8th grade students will attend one of the four elementary schools, and there are also two middle schools in Freehold. Freehold offers a full-day kindergarten program . You will also find private schools nearby. High school children will attend the Freehold Regional High School District. The Freehold Regional High School District consists of six high schools. 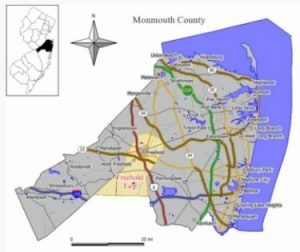 The schools are Freehold Township, Manalapan, Colts Neck, Freehold, Howell and Marlboro. Therefore, children will attend the high school according to boundaries set by the district. Most students from Freehold will attend Freehold Township High School. Some will attend Freehold Boro. SAT scores at all of the high schools are consistently higher than the state and national averages. As a result, in excess of 87 percent of the district’s students continue with higher education.